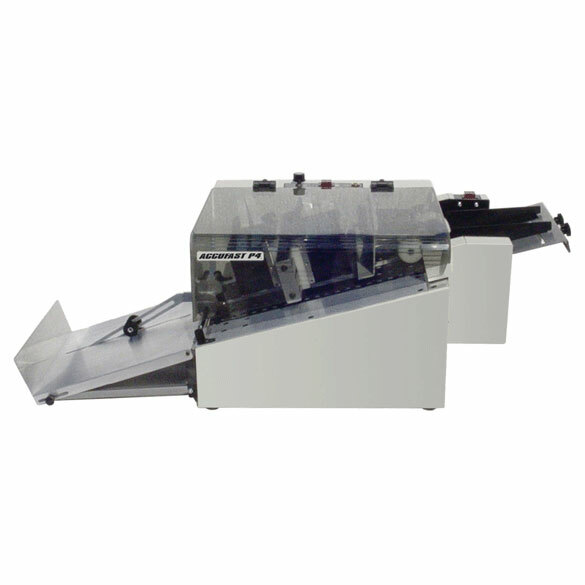 The Accufast P4 Thermal Ink Jet Printer is a fully integrated feeding and handling system for flat cartons and cards that is supplied with one “Split Print Imager”. Each section of the Split Imager is capable of holding two print cartridges (each cartridge with a 1/2” print height) – for a total of 1” print width from each “Split”. Between the two “Split” imagers the total print height is 2”. Each section of the Imager can be precisely positioned along a rail for exact print positioning. This print system can supplied with a selection of feeding devices to suit the size and characteristics of the goods to be printed. If needed a sliding stand can also be provided for easy changeover from one feeder to another. The system takes a single item to be printed from the bottom of a controlled stack, feeds that single item into the print portion of the system where the inkjet cartridges can deposit the image, text, bar codes or other print images that have been design on the free software. Once printed, each item can be dropped into a simple collection device or placed onto an extended shingling conveyor for easy further handling without print interruption. The P-4 is capable of ultra-high print speeds and data handling that allow for individualized printing of ever changing information without print speed sacrifice. Print resolutions up to 900 dots per inch are easily selectable in the programming software in order to give the best print images possible on any material. A wide range of inkjet inks in simple to exchange cartridges are available to suit virtually any print need or material including UV light curable inks for superior abrasion resistance and totally solvent free printing. Printing a simple lot code and expiration date on cartons and cards is a perfect task for the P-4 as is the adding of full ingredient information over a lager print area. Feel free to challenge the P-4 to see if it can handle the task you face.